Color Stretch Film is ideal for warehouse color coding, dating inventory, identifying international shipments, or providing tamperproof evidence. Colored stretch wrap can also keep you organized by preventing unwanted reloading and cross-docking. Our puncture resistant color stretch wrap is 80 gauge cast film. 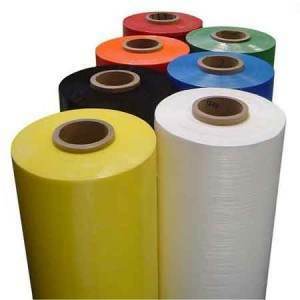 Because it is cast, color stretch film comes off the roll smoothly and quietly and still remains transparent for easy load identification. We offer seven different colors to choose from when ordering your color stretch wrap.